Constitution Gardens…..We Can Grow That!!! This is a re-post from a previous blog post for a reason. I want to Welcome with open arms Catherine Townsend, who has been entrusted to Grow the commitment that will make Constitution Gardens a reality. I am sure that ANY passionate and committed Steward of this land or avid gardener is ready, willing and able to lend our hands and heart to assist. That being said, Cheers to this year’s luncheon and let’s ALL help GET THIS DONE!!! Please enjoy this re-cap….a little perspective for today! What garden do you know about in Washington, DC that is 50 acres of beautiful paths, trees, a lake and an island, is open 24 hours a day, has over 29 million visitors a year, is quiet, peaceful and serene in spite of the busy streets that border the perimeter??? Where can you find ducks putting on a show, benches that provide a welcome place to rest under the shade trees behind the Lincoln Memorial and between two monuments that memorialize two wars – World War II and Vietnam? How can you grow a generation of caring young people who only read about these wars in school and encourage them to care about a sustainable landscape that will educate and allow visitors and residents alike to enjoy this place of peace? Just like in a garden, one must cultivate the soil (Trust for The National Mall) and sow the seed(message) carefully, add the necessary items (fertilizer, water) needed for the garden to thrive, add a few amendments (education/entertainment) plant the right plant (opportunity to socialize) and watch it come to life and grow. The last time Constitution Gardens was actually given any major attention was a restoration effort 39+/- years ago. Created to celebrate bicentennial events, Signers Island was designed and installed in 1982. These stones hold the signatures of the Declaration of Independence. At that time there were plans to make it a pleasing place for all to enjoy, however budgets did not allow additional enhancements to come to fruition. Fast forward to current times, there was a Nationwide design competition, offering the opportunity for Landscape Designers to come up with a plan that was sustainable in its operations, environmentally sound and user-friendly. The designs also had to offer an educational component, so that families could enjoy this place of peace together and have the opportunity to learn something new. The ability to offer some form of entertainment was like the fertilizer to the project. When you have planted a seed called Constitution Gardens and then never invest in it $750+ million in long overdue repairs to the almost non-existent gardens, deteriorating monuments, sidewalks and the beautiful lake – is like having a beautiful plant and neglecting to invest in fertilizer so that it can grow. 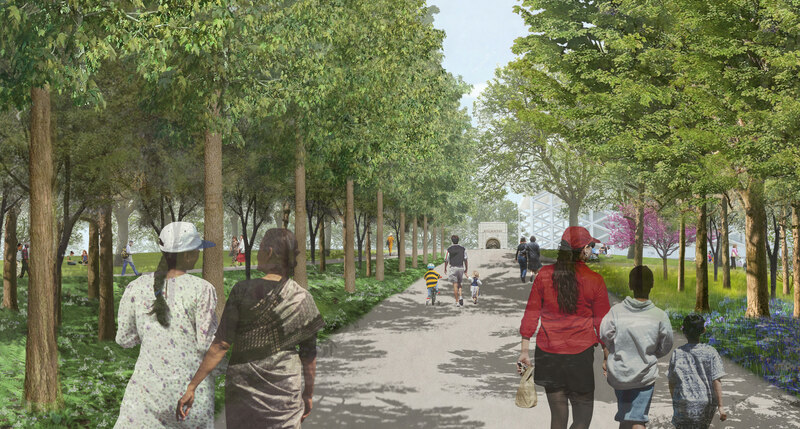 Now that the vision of Constitution Gardens has been designed by Rogers Partner Architects + Urban Designers and Peter Walker Partners Landscape Architect’s, the need for this site to become all that it can be is so very important. I recently had the opportunity to hear Ms. Sheila Johnson,Founder and CEO, Salamander Hotels and Resorts, speak on the importance of Constitution Gardens renovations and how it is our duty to leave it in good shape for the generations that we may leave behind. Sharing similar sentiments, Caroline Cunningham, President, Trust for The National Mall shared that where we were sitting at this luncheon would one day be a place to grab a sandwich or a drink, creating moments to pause and enjoy the beauty that surrounds us. Both of these ladies spoke words that if shared, would blow into the hearts and minds of the younger folks who are able to sow these seeds via text and other forms of social media with their friends and meet up in the gardens. A gathering place for families, friends, tourists and residents to pause, feeling the serenity of Constitution Gardens and linger awhile. As we know, watching a seed burst forth with the tiny tendrils of promise is an awesome thing. 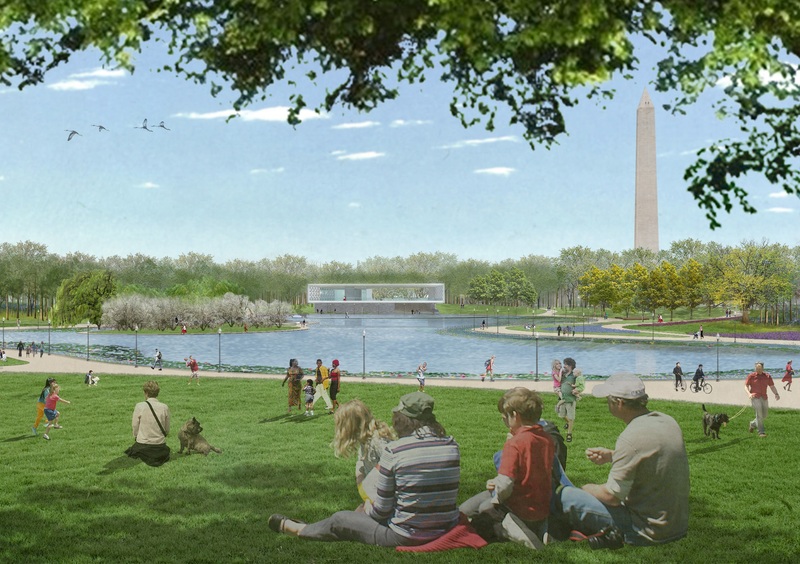 I’d like to think that after the Annual Luncheon and other events that the Trust for the National Mall has and will sponsor will propagate this vision of what Constitution Gardens can become. The Landmark Campaign will do this (and more) to engage future generations to enjoy the gardens and parks that surround them. Offering 2 days of music, 40 different Artists on 5 stages…well, its like a bee pollinating the masses…all for a good cause of course. Cultivating friendships with other like minded people on a beautiful September weekend, while raising attention (as well as money) to Constitution Gardens is definitely like sowing more seeds for future generations to come. Our young people will see that every garden needs to be cared for, fertilized, given a little bit of attention, so that all can enjoy. Constitution Gardens……YES WE CAN GROW THIS!!! I don’t think I have ever read anything about Constitution Gardens. I must make it a destination. Thank you for enlightening me Teresa. Great post and the commenters is so right – people who’ve lived here forever don’t know Con. Gardens even exists. But they will when it’s redone. THe plans are awesome.